A new market shopping website designed and created by SDA is proving to be a hit with customers – and one local is in the money after winning a £100 shopping spree on the site. 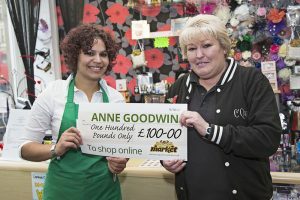 Anne Goodwin, who owns C’Quinz gifts and accessories shop on Blackburn Road, was announced as the lucky winner of a competition organised to mark the launch of Accrington Market’s new ecommerce shopping website. The market website – a 12 month pilot scheme produced by SDA working in conjunction with Hyndburn Borough Council – was officially launched in style last month by celebrity guest Jesse McClure, the larger than life TV star who features in Storage Hunters. 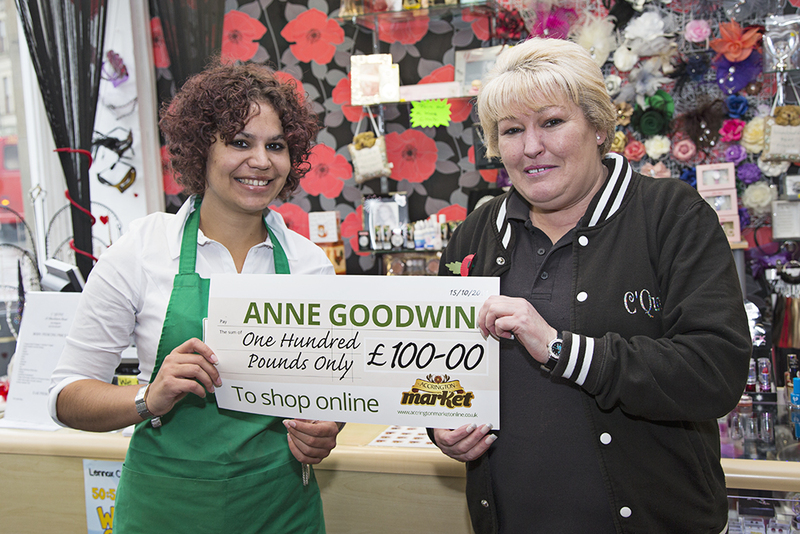 Anne was presented with her £100 winning shopping voucher by Kirsty Lauder, Accrington Market Hall’s personal shopper for the new website. Kirsty Lauder, Accrington Market personal shopper said: “Congratulations to Anne – we hope she has a great time shopping ‘til she drops on our fantastic new website! “Orders are coming in thick and fast so we’re off to a brilliant start. Accrington Market Online was the brainchild of SDA – we understand markets and saw a niche for an online shopping experience that combined the great things about traditional markets with modern ways to buy. Launched in September 2014, Accrington Market Online is a 12-month pilot scheme to drive footfall back into the town’s beautiful Victorian Market Hall by offering alternative ways to shop. This entry was posted in Accrington, Shop Local and tagged accrington, hyndburn, markets, shop local on October 23, 2014 by admin.